In my post before Quigley got sick, I mentioned that I had been decluttering my house and had even gotten a bit obsessive about it. I’m not sure that is true exactly, but I did spend a lot of time on it, maybe not because I was obsessed so much as because my house was going to be a gigantic mess until I got it done. Before we had the liquidator come out and take everything out of my mother’s house, my sister and I went through the last of her things including her stacks of unframed watercolors… My sister had an especially hard time not taking all of them, but all of them would not fit in her car, so she had to decide. She took maybe a quarter of them home. I managed to restrain myself and ended up taking only four of them, one of which I hung immediately. It’s a half sheet painting. To hang it, I had to take down the nearly-whole sheet painting already hanging in the desired spot and do something with it. It was a painting that had won Honorable Mention in a national show (The Western Federation of Watercolor Societies Annual Show) so it was a little weird… you have to be weird — or really, really good — to get into those kinds of shows. So while on the one hand, this was my award-winning painting (they even gave me money!) and I wanted to have it up, on the other… I didn’t really enjoy looking at it. And it absolutely didn’t go with my mother’s painting. So I took it down, moved the other painting that was on the same wall and put up my mother’s. The larger painting I stuck in my office until I could figure out what to do with it. Then something went through on the Flylady email digest I get about looking at your walls and seeing the clutter there. Do you have too many paintings and decorations? Too much stuff on the walls has the same effect as too much stuff everywhere — it provides too much stimulation and generates tension. Reducing the visual clutter tends to produce peace. I know that to be especially true for me. And my walls definitely were cluttered because back when I was doing watercolor, trying to sell my paintings and entering shows I had to have framed paintings. The framed paintings had to be stored and I had no room except for my walls. So every room had multiple paintings to the point it looked a bit like an art gallery. Too much stuff. Having removed the almost-full sheet painting and replaced it with my mother’s, I reduced by half the number of items sitting on the top of the piano beneath the paintings, took two more paintings off the same wall (there had been four to start with), and then sat down to evaluate the results. Yes! Of course once taken down, I had to deal with the paintings: Unframe them, disassemble and wrap up the frames, deal with the glass or plexiglass they’d been glazed with… all this in a room that was already mounded with stacks of Mother’s dishes waiting for my son and daughter-in-law to claim them, several large boxes of documents waiting to be shredded or discarded. Boxes of Christmas ornaments I’d decided to take from my mother’s collection and a bunch of other stuff. It was a formidable mess. I think I may have spent a couple of weeks on that. And tha work was indeed semi-obsessive. I’d get an idea, then carry it out, to see if it’d work. Then I’d be tired. Maybe it wouldn’t work, and then I’d be really tired… But falling asleep that night, or waking up in the morning or maybe just while I ate breakfast, I’d suddenly get a new idea for what to do and off I’d go again. Anyway, it’s done now. Largely. I may put one painting back. It’s still waiting for me to decide. I want to get a new corner lamp for the living room before I do. So. That’s one of the things that has kept me away from blogging — sometimes quite literally, since with all the stuff in my office I couldn’t use my computer. 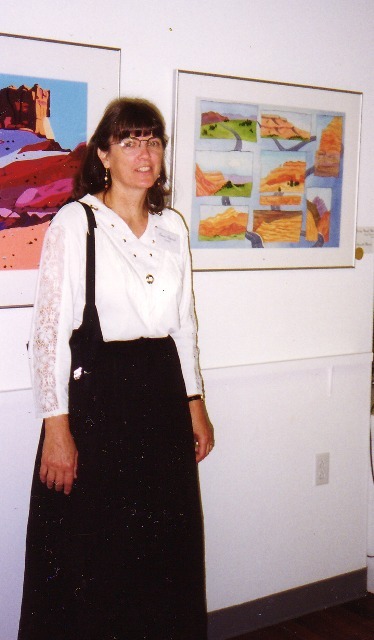 Here’s a picture of me and my award-winning painting at the Western Fed Show back in 1999. My painting is the one to my left and was called Driving Thru Utah, based on a page in my sketchbook that I’d made while, er, driving through Utah. I really wish, however, that I’d painted the one behind me, but oh well! This entry was posted in Homemaking stuff, Life and tagged Decluttering, Flylady, Life, visual clutter on July 27, 2011 by Karen Hancock. It’s been good hearing from you again, Karen! It’s funny, this evening after I read through your post I jumped to another blog I follow and read this G. K. Chesterton quote: “Art consists of limitation. The most beautiful part of every picture is the frame.” At first I wasn’t sure if I agreed, but then I was thinking that if you looked at the walls as the “frame” it made a lot of sense. Our art needs limits in order to shine. My watercolor teacher (still a friend, though I haven’t seriously painted in years) regularly swaps out her art in her frames. I can’t imagine how she stores all the work she’s done. I’ve only got a few paintings, so have been able to put up my favorites or give them to family. There are times I wish I had more walls on which to put things, but for the most part I’m glad I’m limited. De-cluttering is a blessing! I’m glad you’ve had time to do a lot of it. Thanks, Loren. I love your quote. That is so true. It got me thinking about one of the biggest things in composition is what you will put in and what you will not. It really is all about limitation… And it applies to writing stories too. Cool to know you used to paint, as well. Great point connecting it to stories, too. That’s a tricky one for me! Yep, I got to do watercolors for a few years and thoroughly enjoyed it. Right now my “works of art” are running around the house, but someday I hope to get the paintbrush out again.